Shooter Simulation 2018-10-19 theHunter claims to be one of the world's most realistic hunting simulation game, and to some extent, the game is exactly what it claimed to be. Track, spot and kill up to 39 different species of prey in a myriad of picturesque hunting grounds worldwide using a variety of hunter-favorite hunting rifles! 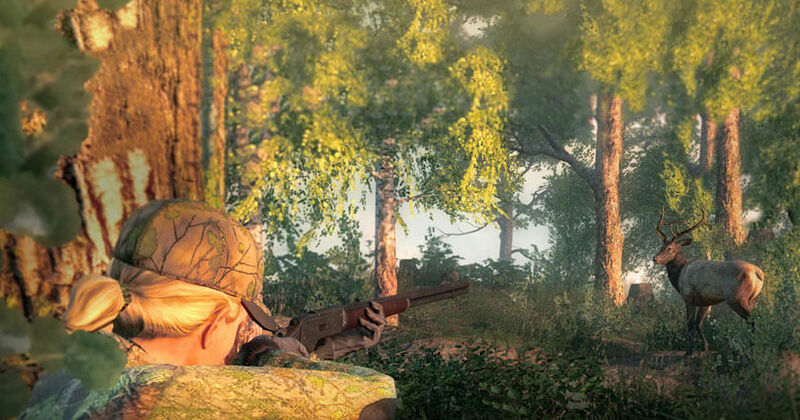 Put your hunting skills to the test and try to get a clean kill to ensure that your kill trophy stays intact. The best part about the game is definitely its quality graphics and sound. Both of them are work well together to create this impressively immersive game world for us virtual hunters to hunt our prey in. Of course, that's not mentioning the amazing realistic hunting process that you'll need to rely on to bag your prey. Top Reviews Games Like Second Life Games Like IMVU Games Like Animal Jam Games Like Fantage Games Like Fortnite Battle Royale Games Like League of Legends Games Like Candy Crush Saga Games Like Everwing Recent Reviews Games Like Scythe Games Like Pet Rescue Puzzle Saga Games Like Meeple Station Games Like Robothorium Games Like Relic Raiders Games Like UNO! Games Like Legend of Warships Games Like Kings of War Recent Lists Best Augmented Reality Games Best Free Browser MMORPGs in 2018 The Ultimate Gacha Games List Old Virtual Worlds for Kids that We Want Rewritten The Ultimate Final Fantasy Games List More Lists Recent Articles Blue Potion’s ‘Echo of Soul Online’ is Now Available on Steam Early Access Record of Lodoss War Online: Second Class Change Has Arrived Top 3 Club Penguin Games You Can Play For Free Most Exciting E3 2018 Game Announcements 5 Most Anticipated Games of 2018 More Articles Random Games Games Like Dauntless Games Like Harvest Moon: Skytree Village Games Like Travian Kingdoms Games Like Cooking Mama Let's Cook! Games Like Royal Envoy 2 Games Like Need for Speed: Most Wanted Games Like Shards of Magic Games Like Ragnarok Online More Games Like Games Like Monster Hunter 3 Ultimate Games Like Balls Games Like Heroes of Might & Magic 3 Games Like Mount & Blade Games Like Rise to Ruins Games Like Hello, Neighbor!